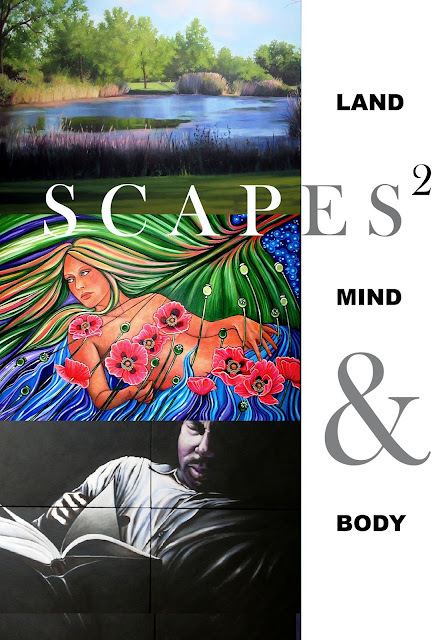 "Scapes 2: Land, Mind & Body," was the last group exhibit I participated in with my mother, Dzvinka, and my sister, Tatiana. I welcome you to view their blogs. Dzvinka Stifel, Nina Ulana and Tatiana Weinstein (mothers and daughters, respectively), are exhibiting their artwork at the Oak Park Public Library's art gallery during the month of June. Reception will be held on Sunday, June 3 from 2:00 pm - 4:00 pm. Their paintings represent three different perspectives of our external and internal worlds in the form of landscapes, mindscapes and bodyscapes. Dzvinka's landscapes depict scenes from the road, in the rural Midwest. The artist's goal is to inspire gratitude of the natural beauty around us in ordinary scenes. Nina's mindscapes represent our internal psyche in dimensional scapes. Sometimes called dreamscapes, her paintings physically depict our imagination and our subconscious. Tatiana's bodyscapes combine the still life and figurative painting. Bodies and books are her subject matter as well as her passion.